Rashford, on his 100th United appearance, rifled Paul Pogba's inviting pass over the top past Kasper Schmeichel with nine minutes gone as United took full advantage of Leicester's run of slow starts this season. But their intensity did not match that of recent games and they created little else before half-time, although Leicester also looked devoid of ideas. After half-time the hosts improved and Rachid Ghezzal's free kick forced a save from David de Gea before Jonny Evans missed a great chance to score against his old club, but United stood firm and move within two points of fourth-placed Chelsea. Leicester: Schmeichel (6), Pereira (6), Evans (6), Maguire (6), Chilwell (7), Mendy (5), Ndidi (6), Barnes (7), Maddison (7), Gray (5), Vardy (6). Subs: Ghezzal (6), Okazaki (6), Iheanacho (n/a). Man Utd: De Gea (6), Young (6), Lindelof (6), Bailly (7), Shaw (7), Herrera (6), Matic (7), Pogba (7), Lingard (6), Rashford (7), Sanchez (5). Subs: Martial (7), Lukaku (6), Jones (n/a). Leicester have struggled to get out of the traps all season, shipping 10 goals in the first 15 minutes of games, and another false start would ultimately prove their downfall yet again. Rashford should have already put United ahead within five minutes, diverting Luke Shaw's perfect cross wide when it was easier to score. But he soon made amends by bringing down an equally fine lofted pass from Pogba, and firing beyond Schmeichel. United's onslaught soon waned but the hosts, despite plenty of territory, could not test De Gea. Harvey Barnes bent a first-time effort beyond the far post from 25 yards and Evans headed wide but, as is becoming a theme, Leicester lacked the ingenuity to even threaten a goal. After half-time it was a different story. De Gea stuck out an arm to ensure Barnes' effort from the angle was going wide within a minute of the restart, before Maddison's deflected free-kick was met acrobatically by Jamie Vardy but clawed off the line by the United goalkeeper. 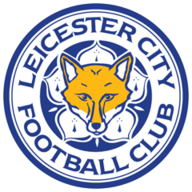 Leicester's one change from their draw at Liverpool was enforced, with Marc Albrighton's injury meaning Harvey Barnes returned to the starting line-up. Ole Gunnar Solskjaer shuffled his Manchester United pack, bringing in Alexis Sanchez as one of four changes. 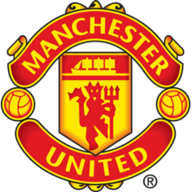 United responded with Rashford firing wide from the edge of the area, but finally there were two teams competing - and substitute Ghezzal tested De Gea before Evans missed his kick from Harry Maguire's header back across goal in their best chance of the afternoon. Nemanja Matic was lucky to avoid a second yellow card late on when he caught Barnes on the thigh but the Leicester winger showed no ill effects moments later to race away down the left and lay the ball back for Vardy - whose shot could not have been closer to De Gea if he tried. Second-half arrivals Romelu Lukaku and Anthony Martial threatened to put the game beyond a revitalised Leicester in the dying moments, but two saves from Schmeichel proved immaterial as the visitors earned their 22nd point from eight league games under Solskjaer. Manchester United have won five consecutive away games in all competitions for the first time since October 2012. Leicester City have lost more Premier League games against Man Utd (17) than they have against any other side. Since Ole Gunnar Solskjaer's first game in charge of Man Utd on December 22, Paul Pogba has had a hand in more Premier League goals than any other player (11 - 6 goals, 5 assists). Leicester have lost four of their last five games in all competitions (D1), as many as they'd lost in their previous 15 matches combined. Marcus Rashford has scored more goals in all competitions since his debut (42) than any other Manchester United player. Manchester United have won four more points than any other Premier League team since Ole Gunnar Solskjaer's first match in charge (W7 D1 L0 - 22 points). Only Ryan Giggs (21y 74d) has reached 100 Premier League appearances for Manchester United at a younger age than Marcus Rashford (21y 95d). Referee Mike Dean handed out eight yellow cards in this match (four to Leicester, four to Man Utd) - only one Premier League game (Arsenal vs Huddersfield in December) has seen more yellow cards awarded this season (9 yellow cards). 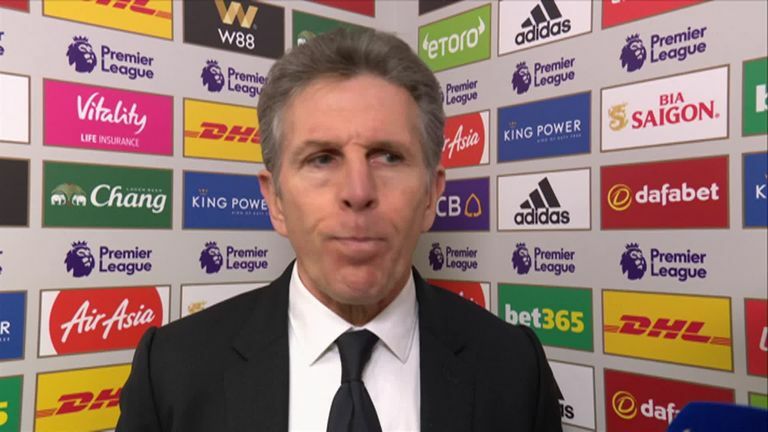 Claude Puel: "I think it's not a fair result but I'm angry about our poor performance at the beginning of the game. To concede another goal early, to have to chase the game is always difficult. "I don't understand sometimes, it's crazy. At the beginning we don't believe enough in our quality because after when we play, we play forward with good intention and can hurt a team like United. Ole Gunnar Solskjaer: "We didn't play particularly well, we could have slowed it down in the second half but we defended well. Eric [Bailly] and Victor [Lindelof] were fantastic, and David de Gea. "We put our bodies on the line, there were a couple of bruised noses, knees and dead legs but we fought for the three points." 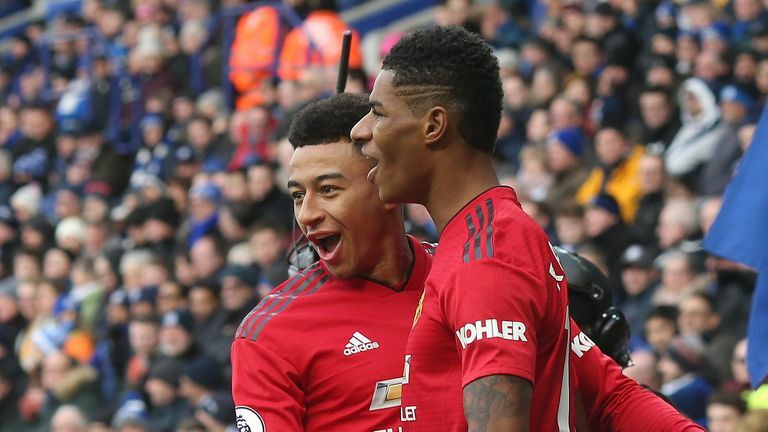 Rashford kept up his sensational scoring run with a sixth goal in eight league games at Leicester, although he could have had another even before that. Over the course of the 90 minutes he had more shots than anyone else (5) while also putting in a defensive shift by making more clearances (3) than anyone else outside of United's back five. Both of these sides are back on Sky Sports next weekend. United travel to Fulham, live on Sky Sports Premier League from 11.30am on Saturday. Leicester visit Tottenham on Renault Super Sunday, live on Sky Sports Premier League from 12.30pm.